Relationships. Sometimes they're great, and sometimes they're difficultbut the world would be a mighty lonely place without them. Did you know that humans are wired to have relationships? And that we benefit from all types of connectionsfrom romantic relationships and close friendships to family bonds and even the casual ties we have with our acquaintances? This book explores relationships from all angles. You'll discover: -what the four types of relationships are and how they benefit you. -what the building blocks of healthy relationships are and how to make them work for you. -how to deal with issues such as family drama, fickle friendships, dating difficulties, and more. -what the warning signs of bad relationships are and what to do if you re facing abuse. -how to handle conflict in a relationship while staying true to yourself. Supplemented with articles and information from USA TODAY, the Nation's No. 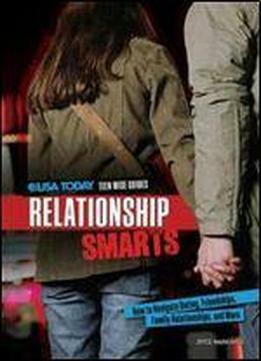 1 Newspaper, Relationship Smarts delivers solid advice and firsthand stories of real teens facing many of the same types of situations you are. Ready to wise up on relationships? Read on!